BLOOMINGTON, Ind. – Indiana didn’t hide or alter its strategy whenever an Ohio State player set a screen on the ball in Sunday’s Big Ten showdown. The defenders hedged hard, and Chris Holtmann saw an opening. With 34 seconds remaining, he put the ball in the hands of C.J. Jackson and had Andre Wesson set a screen on his defender. Knowing Justin Smith, Wesson’s defender, would hedge hard, he had Wesson slip quickly to the paint where Smith didn’t have help. Kaleb Wesson stood behind the 3-point line in order to pull Juwan Morgan out of the paint. Romeo Langford nearly rushed over and helped in time, but Andre Wesson received a perfectly arced pass from Jackson and finished a two-handed dunk to break a 52-52 tie with 20.8 seconds remaining and gave the Buckeyes a two-point lead. Holtmann had never drawn that play up before, but it worked exactly as designed. “That's about a 10 out of 10, and it rarely happens for you as coaches, honestly, where you get exactly late what you're trying to get,” Holtmann said. “I may not say rarely, but it doesn't happen a lot. Maybe you get a tip-in or they take that away and a guy makes a play to win the game. A few times where you get exactly what you're looking for. We just knew they were going to be heavy on the ball screen, so we tried to slip him out and put Kaleb high. 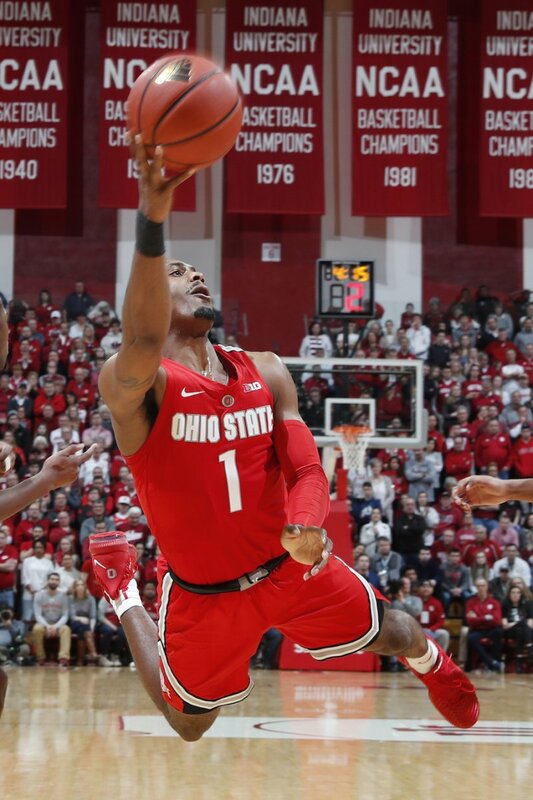 Langford attempted what would have been a go-ahead 3-pointer with 12 seconds remaining, but came up empty, and Devonte Green’s would-be game-tying triple with three seconds remaining also missed to ensure Ohio State’s 55-52 victory. Chris Holtmann wouldn’t have drawn up a play for Andre Wesson with the game in the balance at the beginning of the season. Not until about one-third of the way through the season did he feel comfortable having Wesson be the recipient of such a play design, he said. Holtmann wanted the junior to make strides as a scorer, which he has done this season. Andre Wesson scored in double figures just once last season, but averages 8.6 points per game this year and had 15 points against the Hoosiers for his 10th game with at least 10 points this season. Ohio State went extended stretches without points on Sunday, but Wesson led the team in scoring and had 11 points just in the second half. Jackson and Musa Jallow made a pair of plays to set Wesson and the Buckeyes up for the game-winning dunk. Just as he did nearly one year ago, Jackson drilled a deep, contested triple late in the game. Last year, Jackson’s 3-pointer with Ohio State trailing by one point in double overtime with 1.6 seconds remaining gave the Buckeyes the win at Assembly Hall in Bloomington, Indiana, and he set the Buckeyes up for another win on Sunday. Green had given Indiana a 52-49 lead, the Hoosiers’ first lead of the entire game, capping off a 14-2 run with a 3-pointer that electrified the home crowd with less than two minutes remaining. The Buckeyes followed that up with a “busted” play, but Jackson bailed them out. Keyshawn Woods passed him the ball with five seconds remaining in the shot clock, and he surveyed the court, didn’t see anyone open and chucked the ball up with a defender in his face. “I just saw the shot clock winding down, and just based on how the flow of the game was and we were down three, so we kind of needed something," Jackson said. "So I kind of just stepped right into and and shot it." Jackson drained it. Just like last year. “He has an incredible knack for that,” Holtmann said. Same building. Similar shot. Same result. Jallow also put Ohio State in position to win by forcing a turnover with 42 seconds remaining. Indiana had the ball with a shot to break the tie, but the Hoosiers coughing up the ball gave the Buckeyes possession, leading to Wesson’s dunk. Jallow did not score a single point and hasn’t scored in more than more than 70 straight minutes on the court, but he made an impact Sunday defensively, which has kept him in the starting lineup. Holtmann called Jallow's defense “outstanding,” and he also grabbed six boards. Ohio State and Indiana slogged through 38 minutes of poor play on both sides of the ball, but the Buckeyes held the lead for that entire time. Green’s 3-pointer to take the Hoosiers’ first lead of the game with less than two minutes remaining threatened to devastate Ohio State. But Jackson threw in a “prayer” and Wesson finished the dunk, giving the Buckeyes their third straight victory. The season seemed headed in the wrong way not too long ago, but Ohio State has steadied itself and has a chance to make it four wins in a row when it faces Illinois at home on Thursday.